In many cases when an audio company manufactures an integrated amplifier, it compromises of either performance or flexibility of the product. The integrated amplifiers by McIntosh share same build quality of separate components and performance. The CNC machined front-panel glass and silent electro-magnetic switching sources, to Autoformer technology assures that you get all power that was paid regardless of how loudspeaker is connected! This new MA-6600, has a tuner module used for outstanding sound which includes HD radio. 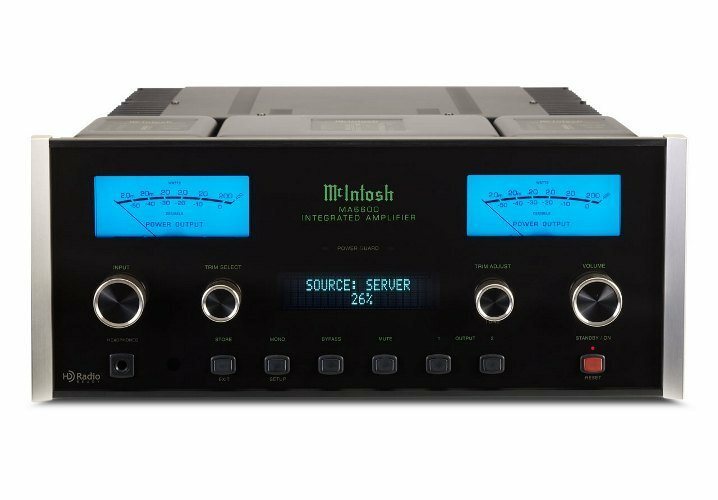 McIntosh provides you performance and flexibility, all in one unit! These days one takes advantage of traditional McIntosh standards of excellence in the MA-6600 Integrated Amplifier. The Power Amplifier section of this MA-6600, has power output of 200 watts per channel, which can drive pair of quality Loudspeakers to a high performance level. The Preamplifier section which is flexible enough provides connections for various input sources drives an external power amp and electro-magnetic input switching not only insures ease of use, but makes maintenance an easy thing! The addition of optional tuner module into this amplifier transforms this unit into an ultra high grade receiver which allows you to receive regular AM and FM; but also the new incredible HD Radio that is now being broadcast as well!